Gary Stairs’ Common Buckeye record is quite interesting. With those sorts of numbers it is likely that Common Buckeye will breed in the Maritimes this year. If you see buckeyes watch for any egg-laying. In Maine, the species has bred on Slenderleaf False Foxglove (Agalinis tenuifolia). 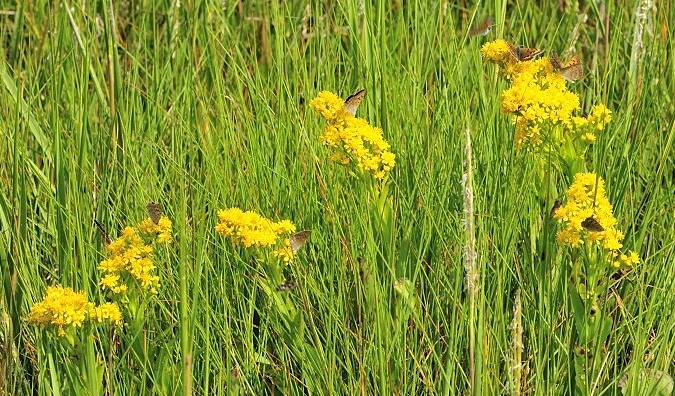 In Connecticut, the species has bred on Common Plantain (Plantago major) and Butter-and-Eggs (Linaria vulgaris). Phil Schappert’s Salt Marsh Copper record from Three Brooks is also noteworthy. 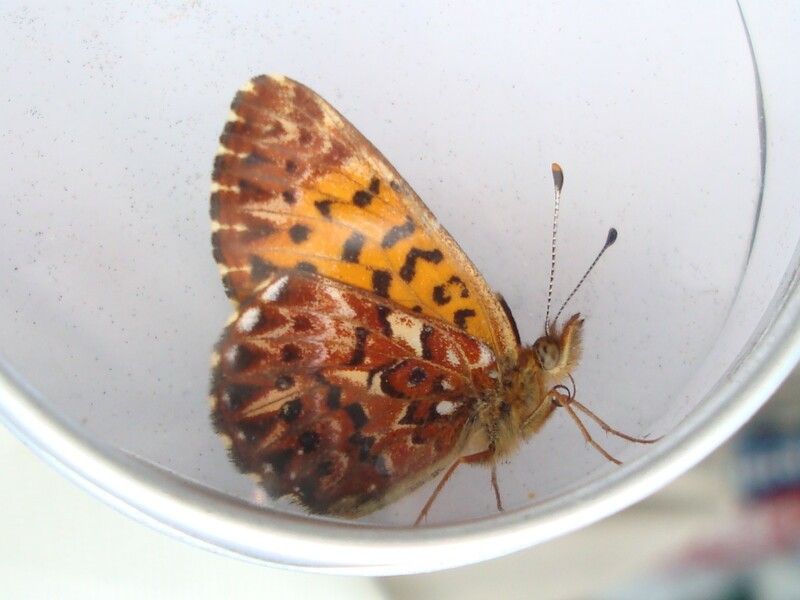 As detailed in the 2012 MBA newsletter, a large gap exists between the known mainland Nova Scotia Salt Marsh Copper populations and the newly discovered Cape Breton Island populations. Previously, the most easterly known mainland population was at Brule (10km east of Tatamagouche). Phil’s record is about 35km east of Brule. Right now is the time to be looking for Salt Marsh Copper. Sarah Robinson and I were at a salt marsh on Pokesudie Island, NB this week and saw about 50 Salt Marsh Coppers in an hour. We also searched Scotch Lovage in the dunes around the salt marsh and found a Short-tailed Swallowtail caterpillar (see the last post to see a photo of this species’ caterpillar). So if you are near a salt marsh go have a look for these two species. Salt Marsh Copper can be expected all along the Northumberland coast, the PEI coast, the coast of Cape Breton, and maybe even NS’s Atlantic coast. Short-tailed Swallowtail is known from NB’s Northumberland Coast and the coast of Cape Breton. It has never been recorded on PEI or mainland Nova Scotia, but it certainly could occur there in the right habitat! If you do find likely Short-tailed Swallowtail caterpillars in an unusual spot (like PEI or inland northern NB) collect one live or let me know about it (jklymkoATmta.ca), it would be important to rear out the caterpillar to confirm the presence of the species.